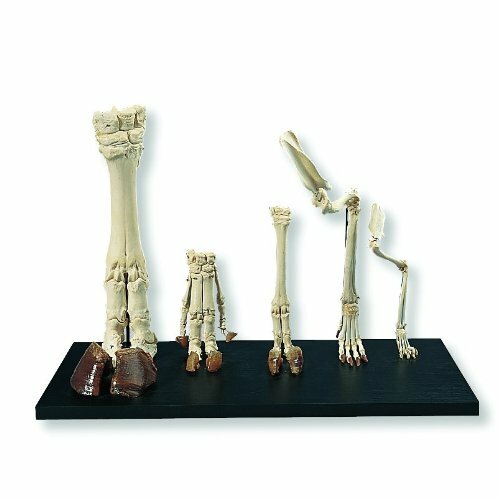 The 3B Scientific T30024 model displays a representative set of mammalian feet, with real animal skeleton bones for detailed study. The model consists of the following separately mounted specimens: a horse or cow foot, a pig hoof, a sheep hoof, a leg skeleton with shoulder blade of a cat, a leg skeleton with a shoulder blade of a hare, and a leg skeleton with a shoulder blade of a dog. The leg skeletons may be delivered without the scapula bone. The T30024 has a wood base for easy demonstration. Anatomical models are typically used as educational aids in medical and scientific classroom and office settings.